Application for the foodpanda Innovation Scholarship 2017 is now open. foodpanda is the leading food delivery service provider in Hong Kong and operate in 23 different countries. The application for the foodpanda scholarship calls for students to develop and submit their own innovative business plan for an online business in Hong Kong. The Scholarship is open to Hong Kong-based students and the winner will receive a one-off cash sponsorship of HK$12,000 to help cover their tuition and other academic costs, as well as the possibility of collaborating with the experts at foodpanda with a view to putting their plan into action. The scholarship is designed to encourage young, business-minded students aspiring to be the next Mark Zuckerberg to apply their ingenuity and creativity, think outside the box and come up with innovative new ideas that can stand out in the competitive online marketplace. Follow this link to find more information about how to apply. As a prime example of how innovation and hard work can lead to rapid growth in the ever changing landscape of E-commerce, foodpanda has an keen understanding of the need to support new thinking and growing talent. This belief in empowering the societies they operate in led them to create several scholarships for students to directly benefit researchers in those locations. 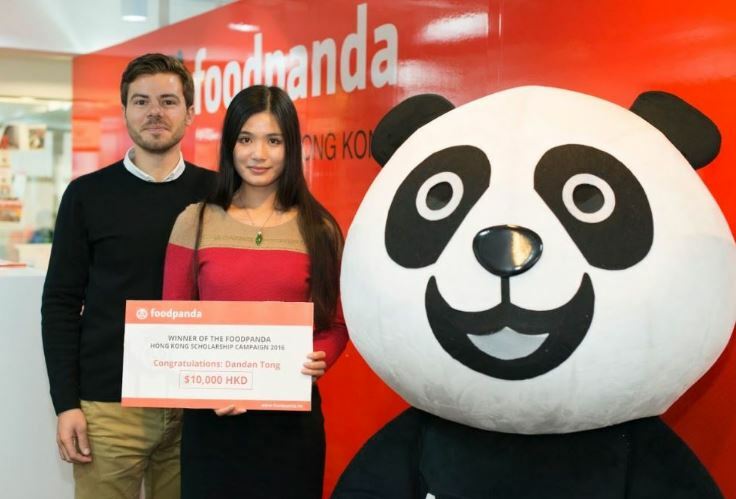 As well as receiving the cash sum to support her education, Dandan was also able to conduct experiments and surveys with the help and support from foodpanda. Applicants should be full time students enrolled in a Hong Kong university for the academic year 2016/2017. Applications, including the student’s business plan and all other relevant documents, should be submitted before June 30, 00:00 HKT. As well as the main award recipient, the first 100 applicants to successfully submit a complete application will each receive a foodpanda voucher worth HK$100. Ready to apply? Find more information here!